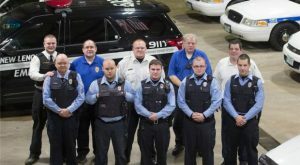 The New Lenox Emergency Services & Disaster Agency is comprised of volunteer officers. ESDA serves the Village of New Lenox and surrounding communities through Mutual Aid support. The organization is deployed for emergency and non-emergency situations. This community-based organization trains all officers in many areas including CPR/First Aid, emergency response, security, traffic control, etc. New Lenox ESDA officers bring their dedication to the organization to serve the community in times of need. To join New Lenox ESDA, click here!